The green scarved army with the message of peace from the heartland of Islam gave their second presentation in two days in the holy precincts of the Sai Kulwant Hall. After the soul uplifting performance of the Whirling Dervishes of Turkey, the other devotees from the Region offered a beautiful musical garland to their Lord. Entitled "Sarva Devata Ateeta Swaroopa Karuna Sagar Sai" (which translates to My Lord Sai who is the ocean of Mercy and transcendental of all forms of God), the programme started with a brief introduction where in the narrator spoke about the unity of religions, the compassion of Bhagawan and the need to experience His love. This was followed by the chanting of a few verses of the Holy Quran. This gave the cue for the start of the music programme, a string of Arabic Bhajans. Starting with Ganapathi Prarthana, it went on to the title song, "Sarva Dharma Ateeta..." followed by "The Chosen Mother", "Sai Buddha", "Sai Easa", "Allah Sai" and finally "We Love You Swami". The songs were interspersed with interesting anecdotes from published works of Bhagawan regarding His Grace falling on the devotees of various God Heads. This included His Darshan as Maha Ganapathi to Swami Amrithananda, the mending of the heart of Prof Haikawa, a Japanese scientist whose parents prayed to Lord Buddha, the appearance of the form of Jesus Christ, the compassionate in photographs clicked of Bhagawan by a Roman Catholic couple and Professor S Bashiruddin's vision of the holy Kaba in Saudi Arabia in the open palms of Bhagawan. At the end of the presentation, the group continued with Bhajans which was followed by the assembly with enthusiasm. Aarati was offered at 1800hrs. . 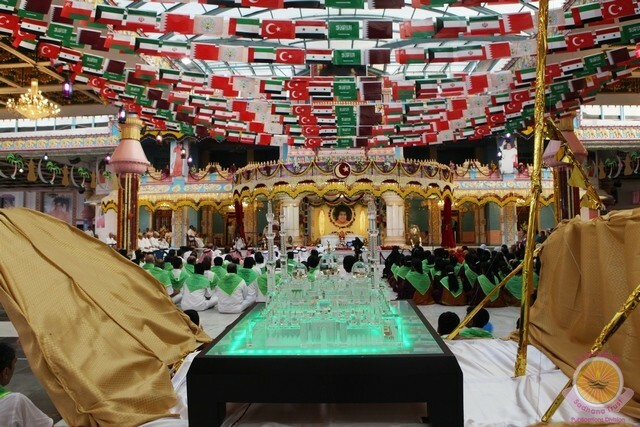 It is Holy Month of Ramadan and a group of devotees from the Arab world are on a pilgrimage to Prasanthi Nilayam, the Ultimate Seat of the Divine. ...And on a pleasant evening, the Universal Mevlei Dance, an Islamic religious rite leading to spiritual bliss stole the limelight on the first day of the two-day scheduled Interfaith Programme by the visiting group from Region 94, in Prasanthi Nilayam. Reminiscing of the cherished memories of Bhagawan's sweet physical presence and personal attention to the pilgrims over the past some years, Region 94 of Sri Sathya Sai Organisations - Overseas has come in a group on 'Sai Pilgrimage 2011' to the Holy Abode of Prasanthi Nilayam. The group comprised of 260 members from nine allied countries of the region, namely, The UAE, Sultanate of Oman, Bahrain, Kuwait, Qatar, Turkey, Saudi Arabia, Syria, and Iran. This evening, on the first day of its scheduled two-day Interfaith Programme, devotees from Turkey, a country with a Muslim majority, offered a special cultural programme in Sai Kulwant Hall. The programme commenced at 1700 hrs. with a religious procession carrying a crystal replica of the Holy Mosque of Abu Dhabi, capital of the UAE. The procession, styled to religious perfection and beauty, commenced from the Dashavatar gate at the en trace of the Ashram. 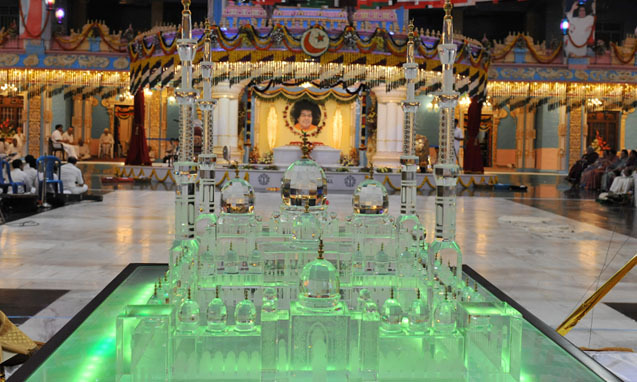 Inching in towards the dais, the altar of the omnipresent Lord, the processionists carrying the crystal replica moved in slow gait, suffused with devotion and dedication, accompanied by rhythmic beats of music and religious chanting of holy hymns of Islam. Representatives from Turkey and Iran followed by other participating countries moved unto the dais, offering obeisance to Bhagawan. The processionists were clad in regional attire of respective countries and were carrying national flags. As the procession completed its round, a brief introduction on Turkish culture and history and that of Islamic religious significance followed before the group burst into singing holy hymns. After the brief chanting four Mevlevis performing the Whirling Dervishes took the centre-stage, moving in slow, steady gait as is proclaimed in their religion. .
SEMA, Sufi whirling is a physically active meditation of the Sufis, popularly practised by the Sufi Dervishes of the Mevlevi order. The 'dance' of the Whirling Dervishes is called Sema and is born out of the inspiration of Mevlana Celaddiin-i Rumi, a 13th century Muslim Saint known throughout the world for his exquisite poems and words of wisdom. Sema represents a mystical journey of man's spiritual ascent. For the next twenty minutes, the dervishes, four in number, with typical head-gear, symbolic of ego's tombstone, with white long skirt, symbolising ego's shroud, occupied the centre-stage, dancing to rhythmic tunes, completely engrossed in the Divine. Beginning with holding arms crosswise, the dervishes moved spinning, slowly blooming their hands, with the right hand directed towards the sky, signalling their readiness to receive Divine beneficence, while gazing left hands turned towards the Earth. Turning from right to left, pivoting around the heart, they moved in steady, rhythmic circular motion, presenting a visual treat of balancing the body and mind, tuning to spiritual perfection. The 'dance' ended with a prayer for the peace of the souls of all prophets and believers. The entire programme was accompanied by soulful music, assisted by five musicians on various instruments, namely, Kanun, a Zither-like musical instrument with 72 strings, Tambur, an ancient form of lute, Ney, a reed flute played in Melvei music. The Whirling Dervish was a collective offering, a prayer to Beloved Bhagawan by the Sai Fraternity from the region to bless them, while they revolve in this circular motion, helping them in the spiritual sense with each and every turn. Offering the dance, they prayed to Bhagawan to help them to reach Him, the Ultimate Source, through the whirling movement.